Vaisnava sanga, association with the devotees, particularly means senior devotees. Since our mission began twenty-two years ago, we've been keen to see that all the devotees as much as possible get the right association, even if it is outside of our mission. For example, we were always anxious to take our devotees to see Srila Bhakti Pramoda Puri Maharaja. We welcome other representatives of other bona-fide lines of Sarasvati Thakura. We do not fear any bona-fide preacher. Rather, we welcome such devotees. However, we have a strong disdain for people who are marketing Krsna consciousness for what we consider name and fame, and along with that, distorting the philosophy of Krsna Consciousness or perverting it in some way. We completely ignore those people that claim to be higher Vaisnavas. According to the ‘chart’ that I have, they don't make the grade. And it is not that we're the only ones that have a chart. No – many others have that same chart and they fully agree. But the principle is that we associate with devotees and we do not neglect the opportunity to associate with higher Vaisnavas who are superior to ourselves. We have shown that, and a lot of people have difficulty nailing us because that’s our track record. I went to Srila Sridhara Maharaja, I went to Srila Puri Maharaja – but I don't go to such-and-such Maharaja. So they can't nail me down and say, "Oh, he doesn't recognize any higher devotees". I have a record – I recognized higher Vaisnavas, but there are others that I don’t recognize at present. That's the challenge. However, these people did not recognize Srila Sridhara Maharaja and Srila Puri Maharaja, and now they’re telling me they've found a great rasikacarya. That doesn't really have any value for me. There’s a proper way to cultivate Krsna Consciousness and there's a proper line. We have to understand what that is. Of course, we learn that by following our guardians. We have a sanga and we welcome other Vaisnavas, but we have a standard that we look for. We are not judgmental – at first we are open and then we judge by the result. In this way we come to reject certain levels of association. But we've always kept the principle of Vaisnava sanga. We have created a sanga of like-minded devotees with some seniority there for guidance, and we recognize the higher Vaisnavas if they are present on this planet. Mathura–vasa means to live in a holy place, to live in the dhama. A dhama is a holy place where Vaisnavas reside. There are many secondary dhamas like Dvaraka, Badarinatha and so many others, but for Gaudiya Vaisnavas there are three dhamas – Vrndavana-dhama, Navadvipa-dhama and Puri-dhama. The temple where we live is considered to be an outpost, like an ambassador’s office in a far off country. Once inside that building it is as if you are in that country. When you walk into the Indian embassy in San Francisco it smells like an Indian bazaar. Why is that? Because every officer’s wife has cooked with Indian spices and his tiffin is sitting on his desk. An assault on an embassy is a direct assault on that country. The embassy is non-different by governmental arrangement from the country. So the asrama or temple is called a ksetra, and by the divine arrangement of Krsna, that is the extended potency of the dhama. By living in a temple or an asrama or by regularly frequenting such a place, it can be considered that you’re living in the dhama. That is one of the main principals that Mahaprabhu has outlined. It is called mathura-vasa – residence in Mathura. Mathura being the greater thing and then that is extended to Navadvipa, Jagannatha Puri and the place where the Deity resides. We have a few nice asramas. We have many beautiful Deities – from the colossal sized Jagannatha to small Radha-Damodara. We have Radha-Madhava, Gaura-Nitai, Gaura-Gadadhara, Sri Nrsinghadeva, Prabhupada’s murti, Salagrama-sila, Govardhana-sila, Govinda-kunda. And we have service in Vrndavana-dhama at Srila Rupa Gosvami’s samadhi and Prabhupada’s place of bhajana. This is a very, very special place. There are hundreds of vyasasanas of Srila Prabhupada, there are puspa-samadhis, there are rooms of Srila Prabhupada in many temples, but there is only one bhajana-kutira at Radha-Damodara, and there is only one samadhi of Rupa Gosvami. We have a place of residence there and we have service there, so in both ways we are fulfilling this instruction of Caitanya Mahaprabhu – one should live in a holy place; one should live in the dhama. Bhagavata-seva or bhagavata-katha – one should hear regularly transcendental literature, particularly the Srimad Bhagavatam. Bhagavata-sravana also means Bhagavad-gita, Caitanya-caritamrta and any literature that describes Krsna and the process of Krsna Consciousness as the way and the means. When there are no classes we should be reading. If we're not doing either one then that is a minus and we have to improve on that. In this way they found a means. But traditionally, going out on the street with a japa bag would not be considered congregational chanting. But in this case, japa became sankirtana. Sankirtana means congregational chanting, and the distribution of Bhagavatam also comes under that category. That was one of the major contributions of Srila Bhaktisiddhanta. In fact he said that the mrdanga can be heard from a distance, but the printing press can be heard all around the world. We take many things for granted now. Everything around you, you subconsciously assume that they’ve always been here – CD players, computers etc. But no – there was no electricity in the world one hundred and fifty years ago and the world was already very old. Great civilizations had already come and gone. Without electricity, without motorcars, people traveled from here to there and back. They managed even without electricity. The printing press was not always there. It was there in a very primitive, rudimentary way in China and some other places, but it was the Gutenberg printing press in Germany that changed the world. That printing press changed the Western world and it has certainly changed India. What is everybody reading this morning, right now as we speak? Everybody’s reading a newspaper which was printed during the night while you were asleep and it was at your door when you woke up this morning. From newspapers to brochures, to propaganda and billboards – it’s all print, print, print. Everything is printed. What do you find that’s written by hand? Very few things. Everything’s printed. Printing has entered every aspect of life, and at one time it didn’t exist. There was no advertising, there were no printed brochures telling you how to do things, no safety manuals – nothing like that existed. It was all handwritten announcements and handwritten books. And it was very costly. 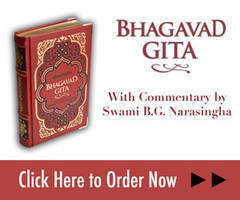 It would cost half a lakh of rupees or more just to get a handwritten Bhagavad-gita. So when the printing press appeared, it changed the world, and one of the major things was that it gave people information and knowledge. This created revolutions and wars. People like Marx, Lenin, Mao – they had their books. They changed the political landscape of a quarter of the world or more with their ideas. Information changed the world. And then of course it drove education. People wanted to be able to read what’s on that piece of paper. So it drove people to learn how to read. Otherwise, who cared to read? What could you read? There was the Bible, and that was basically it. You didn't need to know how to read – storytellers were all around. You didn’t have to read, you just listened. There were storytellers not just in India, but everywhere in the world. In the evenings they would sit around and tell fantastic stories of their heroes or their histories. But then these stories were printed, so in every way it changed the world. And of course, by the time Srila Sarasvati Thakura was present, it was already well established and it was a very powerful tool. 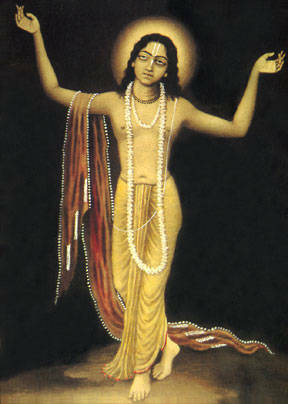 Srila Bhaktisiddhanta Sarasvati Thakura recognized this as a form of sankirtana. Sankirtana is spreading the message of Krsna, the name of Krsna, the sound of Krsna. Of course, the sound isn’t there in the book, but the knowledge is written there. Now the printing press has graduated into the computer and that includes the internet. We preach by the internet, we’ve published a number of wonderful books that have achieved acclaim all over the Vaisnava world, even amongst our so-called 'enemies'. When your adversaries praise you, then you know you’ve really done something. Close to home we pat each other on the back, but when somebody who’s outside says it, that’s more meaningful. And when somebody who is your adversary recognizes your good qualities, you can't get better praise. In a sense, that’s a good thing. I read a story the other day – there was a Christian king called Richard the Lionheart and Saladin, who was the leader of the Muslims and they were having a huge battle in Jerusalem. Suddenly Saladin’s men killed King Richard’s horse. Richard was in the midst of battle and Saladin was in his camp eating grapes watching. When Saladin saw that King Richards’s horse had been killed, he ordered his men, “Send him a new horse”. The Hindu’s used to do that too. Once Emperor Aurangzeb was hunting in the forest when some Hindus captured him. Then they put him in a nice palanquin and took him to his home in Delhi. Aurangzeb killed all those Hindus who brought him home. In Gita it says insult is worse than death. This was their stupidity. They should have got rid of Aurangzeb when they had a chance. They shouldn’t have followed the notion that an insult is worse than death. They were confused with their pride, and then they suffered. That’s not how to deal with an enemy. Saladin recognized Richard as a great warrior. "How can he fight without a horse? Give him a new horse." And Saladin became famous for this type of chivalrous behavior. Before World War One, even the Kaiser of Germany, built a monument to Saladin because of his virtuous character. This man may have been Muslim, but he had such great character. So even some of our so-called non-admirers, recognize the literature that our little asrama has published. The last thing is called arcana-seva, worshipping the Deity. And again in our asrama we’re doing that. Dhama-seva is being in a place where the Deity is worshipped, and Deity worship is yet another thing. So wherever the devotees live, wherever their asramas are, they should establish and worship the Deity. That means attending aratikas of the Deity, serving and making offerings to the Deity, helping in the seva-puja and singing for the Deity. This constitutes arcana. We have that going on. That’s a plus also. So we have more pluses than we have minuses. One godbrother came to me once and told me that his daughter was chanting sixty-four rounds a day. I thought, "She must be miserable!" There’s no chance that a thirteen-year-old girl is relishing the Holy Name eight hours a day with her japa beads. This is not possible. She should be making flower garlands for Krsna, she should be cooking for Krsna, or she should be associating with devotees. She should be doing some japa – but not beaten with some particular regiment. Anyway that particular girl didn’t turn out so well either, I don’t know anybody who did well by such pushy regiments. So I’ve explained many times that I don’t put emphasis on such rigid regiments. They are important and regulation in any of these things is important, but I first put emphasis on the proper attitude of service – how to serve Krsna properly, what should be our attitude of service. After that, I put emphasis on harmony between the devotees. This is because once Prabhupada wrote a letter to the devotees and he said “It is more of a problem to me when you are fighting with each other. It is more of a problem than if you break one of the regulative principles." I read this and I thought, "Yes, because if I have a problem, I suffer. If you do some nonsense, you suffer. But if you start shouting at your godsister or godbrother, then two people are suffering and everybody who has to listen to that nonsense, also suffers. In this way you’re spreading the suffering." And I read the other day, according to Bhaktivinoda Thakura, the forest fire that Krsna extinguishes represents internal quarrel amongst devotees. I’ve seen temples in situations where everybody attended mangala-arati, everybody went on sankirtana, everybody chanted sixteen rounds and when quarreling took place, it destroyed the whole temple – just as fire can burn everything. So we must get beyond petty quarrels because they have the potential to grow into politics and backstabbing and finally burn everything. Krsna kills most of these obstacles that are represented by demons. The first demon that Krsna kills is Putana who represents the false guru. First one must escape the clutches of false guru propaganda. “I am God!" or "I will give you siddha-pranali!" or "I can give you prema” – all this is bogus. One has to escape from that and find a bona-fide representative of Krsna, then real progress can be made. There are many anarthas and they’re all represented by demons. But this particular one was described as a forest fire. This fire was burning at a place called Davanala-kunda and Krsna sucked it up. There was no demon particularly mentioned that caused the fire, and I noticed that there's not much description about this pastime. Sometimes we read in the news that there’s a big fire wherein five people die and millions of dollars worth of damage – when the fire department comes in after the fire is over, they discover that the fire started because of a matchstick – just a small matchstick. It doesn’t require a truck to come crashing through your house to create devastation, it just takes a little thing. The potential of fire is within that small matchstick. So this is like internal fighting. I’ve always tried to keep that to a minimum, get people to sort things out and be aware that these things are not disturbing just for oneself – they’re disturbing for everybody and they have the potential to ruin everything. They also have the potential to create Vaisnava aparadha. The reality is if you get it – you deserve it. One man cheats another man – that means he cheated him in his previous life. Nobody gets something for nothing. Everything is a karmic reaction. Therefore we should not blame others who harm us. In India, if you say one thing against someone, or their caste, or family, then they will practically march armies to Kuruksetra and fight till the last man for their honor. This is nonsense. Just forget about it! What about the quality of forgiveness? What do you think? Were you were born with the wings of an angel, or born wearing a golden kavaca? No! We should understand that we have done so many wrong things in this world. We have even killed people, what to speak of cheating. We did these things and that’s why we’re still here in this material world. The general rule is forgiveness – don’t be offensive, don’t attack others. You may have the right to, but you don’t have to exercise that right. If you exercise that right, the wheel of karma just keeps going round. Yesterday I was reading about the history of Genghis Khan. Before he was born, so many of these tribes were killing each other – "You killed my brother, so I’ll kill your brother." "You killed my father, so I'll kill your father!" They were doing this for thousands of years and finally Genghis Khan came and said, ‘I'll kill all of you!” He killed all the tribal chieftains, united all the tribes and became Genghis Khan. And as soon as he died, they divided into four groups and started killing each other again. Revenge is not part of Vaisnavism, just as fear is not a part of Vaisnavism. In the West they say, "We are god-fearing people." They don’t say, "We are God-loving people." When you read the Bible you had better be afraid because their God will smite you down in a second! Their God can get mean and nasty. Even some sects of early Christians realized this. They thought, "Wait a minute – what has this got to do with love and forgiveness?" So they rejected the Old Testament, which basically means the Jewish Torah, as being the work of the devil. So fear is not a part of Vaisnavism – abhaya (fearlessness) is part of Vaisnavism. Everyone should develop the quality of abhaya. If we analyze what fear is, we can see that it is anxiety in the mind. It goes to the nervous system, goes to the heart – it can even kill you. You can become so afraid that you can actually die of fear. Where does it come from? Why are we afraid? Because of misidentification and attachment. People misidentify themselves with something they are not. In the west if you’re a member of a cult, you are considered to be brainwashed. But the biggest cult is the army. All armies brainwash their soldiers. Politics brainwashes the masses. Recently I saw something about the war in Yugoslavia in the 1990’s. All these people are kissing the flag. They're all thinking, "I’m Serbian!" "I’m Croatian!" "I’m Muslim!" "I’m Christian! ", but they are none of those things. They believe in all these false attachments to the point that they will kill somebody. In some religions, the desire to kill people of other faiths is considered to be the quality of a religious person, but in Vaisnavism the desire to kill your enemy is not a good quality. That’s why good Vaisnava kings gave it all up – because these two things don’t go well together. The great Kulasekara Alvar finally turned his kingdom over to his ministers, went to Sri Rangam and served the Deity for the rest of his life. King Prataparudra was the Vaisnava king of Puri, and he is recognized by mundane historians as having destroyed his kingdom by spending all his money on lavish sankirtana festivals, prasadam distribution and so many other arrangements for Sri Caitanya Mahaprabhu. He didn't care for politics and economics, and the whole thing went down. The two things – this world and that spiritual world – don’t mix, and Krsna Consciousness is not about making the kingdom of God on earth. It's about getting off the earth…not like some crazy cult that wants to catch the tail end of a comet and tells its members to kill themselves. Such horrible things have happened in this world. Krsna Consciousness says live your life fully. You have four choices – brahmacari, grhastha, vanaprastha and sannyasa. You can stay there, you can move through one or two; you can go through all four – but get them right! Don’t be a brahmacari then a sannyasi then a grhastha. Don’t put your pants on, then your underwear – that’ll simply look foolish. First put on your underwear, then your pants. Get it right! There’s an order to things. Theoretically it is not necessary to move through all the asramas. Brahmacari means student life. Then there is grhastha asrama, but there is also grhamedhi life. What is that? That is that selfish family life – I, me and mine. That is not good, that is called grhamedhi. That does not give you liberation. That does not free you from samsara. Grhasta life frees one from samsara up to a certain extent, and then you have to take the next step. In other words, it keeps you in a position until you are ready to take the next step. If you are a grhamedhi, you will hate it – you will hate the idea of vanaprastha, you will hate the idea of giving up anything for Krsna. You want everything for yourself – that is called grhamedhi. Grhastha asrama can lead you to liberation, but the grhamedhi never gets released. A grhastha gets some release in the sense that the opportunity of the next step is appealing. Then it’s the common strength to accept it. Then vanaprastha and then sannyasa life. It’s not always necessary, but what’s necessary in all of them is the chanting of the Holy Name of Krsna, Vaisnava sanga, staying in a holy place, serving the Deity and reading the Srimad Bhagavatam. These five things are the essential things for everybody in every stage of life.